Will Schneider trade first pick for sixth straight draft? John Schneider always wants more draft picks. In his seven Seattle drafts, he has never had fewer than eight. At this point, he has seven for this week’s draft — including an impressive five in the first three rounds — but he seems quite likely to add to his stockpile. He still could add picks by trading Marshawn Lynch and/or Richard Sherman — although the Oakland Raiders and Lynch still have not worked out a contract and Schneider repeated he is not expecting a Sherman deal. Barring a big move with Sherman, then, it looks like Schneider will need to make other deals if he is going to avoid his lowest pick total (the Hawks are without their fourth, traded for Quinton Jefferson in the 2016 draft, and their fifth, forfeited due to offseason workout violations). 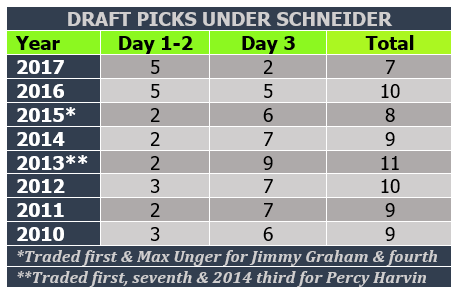 Schneider has traded his top pick in each of the last five drafts, and it certainly seems like he will want to do it again — dropping from the 26th pick and adding another selection in the third or fourth round. In addition to dealing his first-round pick the past five years, he also has made a deal in the second round in six of his seven drafts. He has moved down and still drafted Sherman, Bruce Irvin, Bobby Wagner and Paul Richardson, and his moves down have netted 10 extra players — the best being Jeremy Lane, Cassius Marsh and (likely) Nick Vannett. Schneider has taken advantage of QB-hungry teams twice in the past three drafts, and we previously put forth some ideas of how he might be able to do that again. He also has plenty of ammo to move around on Day 2. If he moves from 26 to the top of the second round, he could move down again or decide to move down from 58 into the third round and add yet another pick. Seattle’s pick list then might look like this: two 2s, four 3s, 4, 6, 7. Schneider said he will touch base with other teams on Wednesday, seeing which ones might be interested in trading in the right situations. He has made deals with 22 teams since he became Seattle’s GM in 2010, and the Hawks have especially close ties to Green Bay, Oakland, Atlanta, Minnesota, Detroit, Kansas City, Buffalo, Baltimore and New Orleans.